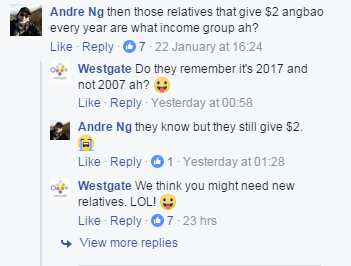 Westgate mall is in a little bit of trouble with netizens right before the festive season. 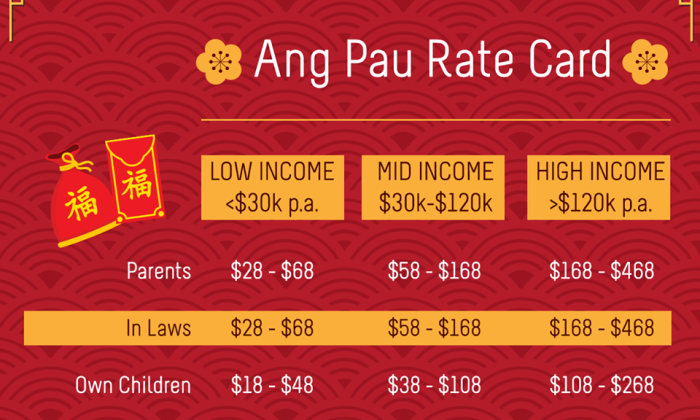 On 21 January, the mall posted on Facebook a guide to how much money people should be stashing away in their ang baos. The post (see above) didn’t seem to come in handy with netizens who in turn criticised the mall for being “materialistic and opportunistic”. Others deemed it “distasteful”. The initial post garnered around 1,424 shares, 247 reactions and 100 comments when last checked by Marketing this morning. Since then, it has been removed. Before the rate card was pulled from its Facebook page, Marketing noticed the mall operator actively engaging with its users in a bid to disperse the tension. 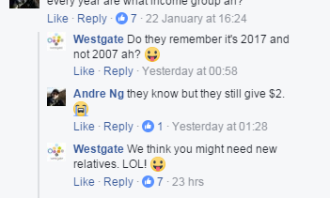 One Facebook user Bei Kang asked about how much a husband should be giving his wife, in response, Westgate’s social team cheekily responded in agreement to give the wife the wallet. Seeing that the drama was not dissipating, Westgate posted a Facebook statement yesterday apologising for the move and assuring netizens that it will learn from the situation. While we laud the move for a brand trying to be witty in a bid to salvage the situation, social media players say the timing might have not been the best one due to the sensitivities surrounding the occasion. Rika Sharma, GM & head of Social@Ogilvy Singapore, said that Westgate’s post is a good example of what brands should not do on social media. 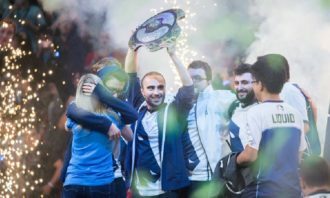 “The company is trying to be on-trend and using a cultural occasion to attract eyeballs, and there is nothing wrong with that. However, there is an #epicfail when it doesn’t recognise the cultural sensitivity and sentiment attached to a celebratory occasion such as Chinese New Year. This includes the act of giving and receiving red packets,” Sharma said. Sharma added that at the same time, Westgate’s employment of humour in its comments to mitigate any escalation of anger was handled in an insensitive manner. Agreeing with her is Kristian Olsen, managing director of Type A, who is of the view that postings with income brackets should not have been released in this context especially as economic outlook is uncertain. “The team should have and should be more sensitive to the everyday person regardless of what income bracket they fall into,” Olsen explained. He added that brands have and will always leverage on key festive events but they must not deviate from what the true meaning of what each festive event represents to the community. Based on the comments, Olsen added that these festive events resonate deeply with all Singaporeans hence a bit of tact and sensitivity must always be observed. “The good thing is the mall operators came out and admitted their mistake and will learn moving forward – as will other brands which are looking from the outside. There are probably a few who are re-looking their CNY posts as we speak,” Olsen said. To be or not to be…witty? This is not the first time a brand has come into the spotlight for being witty or engaging with its users. 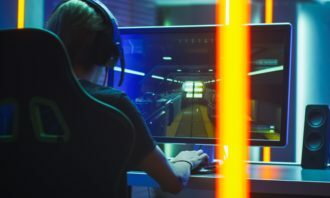 Locally, Singtel was also lauded last year by netizens for an Eminem-inspired rap response to an internet user who experienced issues with its service. 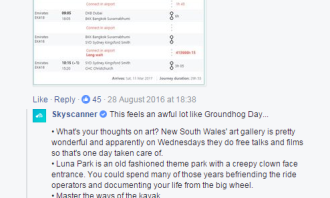 Meanwhile, many social media experts are familiar with Skyscanner’s response in August last year when Facebook user James Lloyd shared a screenshot of a 47-year layover in Thailand that its bookings website suggested when he was booking a flight. He then asked for recommendations from Skyscanner on what he should do during the long layover. Olsen is of the view that social media interactions such as Skyscanner’s are few and far between. “Being engaging in this manner shows the brand’s personable approach and culture – and how it has evidently trickled down to staffs who are their brand guardians. 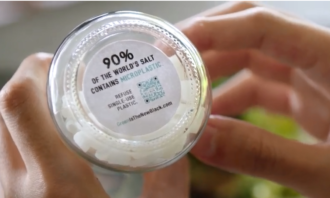 This is especially so when staff interact with customers/users online,” Olsen explained. Moreover, he explained that a brand having a personable or approachable character with a sense of humour is usually received well by their audience when it is appropriate. Social@Ogilvy’s Sharma agreed, adding that the Skyscanner incident was “authentic” as “social media is an extension of what your brand is and how it engages consumers online”. 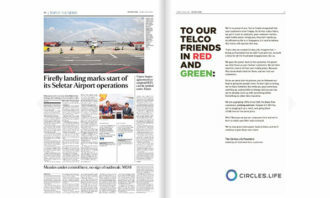 “In Skyscanner and Westgate, we have two companies that have used an opportunity/occasion in two very different ways. 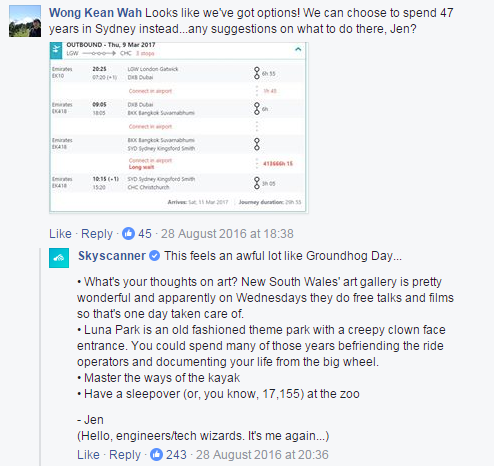 Skyscanner leveraged social media to grow brand love by staying true to the company’s persona while Westgate came across as opportunistic, unfortunately compromising its reputation,” Sharma said. She added that Skyscanner was able to express itself in a witty manner because it was true to what the brand is and the context of the conversation enabled it. 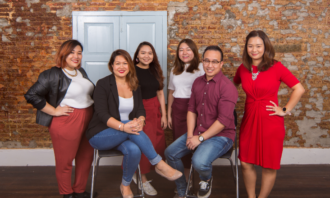 Brand strategy and design agency Brand Union has promoted Andrew Harrison to chief operating officer for Asia Pacific, based out o.. Were you spooked out? ..
During his tenure, Tan focused NTUC FairPrice on its social mission of moderating the cost of living for daily essentials. ..